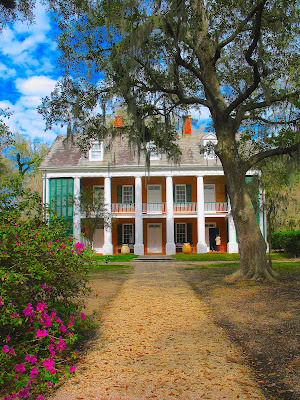 According to Morris Raphael’s book about Weeks Hall, former owner of The Shadows-on-the-Teche in New Iberia, Louisiana, the “master” of The Shadows was an excellent photographer and “anyone with a Leica camera had a passport to The Shadows…Weeks owned two Leicas and was a pioneer of sorts in the field of color photography…Weeks did such brilliant work with the camera that the Eastman Kodak Company recognized his talent [by providing] him with certain film and processes and regarded him as one of their experimental people…”* If Hall were alive today, he’d have given James Edmunds several passports to the Shadows for his work in “Shadows at the Shadows,” an arresting gallery of color photographs now on exhibit at New Iberia’s famous National Trust mansion on the Bayou Teche. I must make the disclaimer that I’m not a professional art critic, but I can tell when a photographer has a “good eye,” and Edmunds’ work surpasses that general evaluation of his photography. The exhibit ranges from a stunning photograph, “Shapes and Shadows,” that features a huge olive jar formerly displayed in Weeks Hall’s garden to an unusual shot of the “Floor at Bergamot” in New York City. Photographs of landscapes, rooms, bridges, the moon, courthouses, and, of course, Edmunds’ favorite subject, his lovely wife Susan (“She mesa me smile” shot with a NIKON D5100) are handsomely framed and hanging on the walls of a room in the Visitor’s Center at The Shadows. The exhibit formally opened October 21 but will be featured through November 28, 2017. I’ve observed Edmunds’ career since the 70’s when he emerged as a photographer, and have watched him expand his skills to include work as publisher of a newspaper, writer, filmmaker, musical producer, art critic — a regular Renaissance man. I’m particularly impressed with his advances in photography. He shares many of his arresting photographs on Facebook where I first noticed his work recording shadowy forms in equally shadowy rooms.